On the 7th June 2014, at 6:34 am, four members of Discovery Flexibles Ltd started the 2014 Ben Nevis Challenge. After hiking 14 miles to the summit of Britain’s tallest mountain and back they then cycled 18 miles to the shores of Loch Lochy to paddle a kayak for 2 miles. 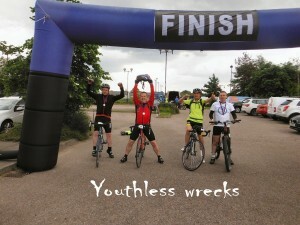 They then cycled a further 12 miles back to Fort William to cross the finish line at 5:17 pm! The finish was a mixture of relief and joy and also elation in the knowledge that we had raised over £2500 for the Scottish Charity Air Ambulance as well as completing a team challenge that saw us all working together as a team to complete such a gruelling event. You can read more about the event on the training page.